Diatomaceous earth (D.E.) has widespread applications for transport, filtration, pest and parasite control and cleaning up messy spills. In addition, scientists use it to purify DNA, measure nutrient content of animal feed and grow hydroponic plants. Food-grade diatomaceous earth introduces a whole host of possible benefits to the immune and digestive systems. While this material is a boon in many respects, its main ingredient, silica, can be harmful to the lungs. D.E. is naturally occurring sedimentary rock that when crumbled and dried has a content of 80 to 90 percent silica, 2 to 4 percent alumina, and 0.2 to 0.5 percent iron oxide. The rock itself is formed from fossilized algae. Its porous surface allows for great absorption and thus acts as a good drying agent. Food-grade D.E. has been shown to be useful in this capacity as a food additive for birds, humans and livestock. Purchased separately and added to feed, D.E. use can be tailored toward the needs of each animal. Parasites are a common problem for birds. Diatomaceous earth is effective for both internal and external parasite control. When added to chicken feed at a 2 percent ratio, D.E. dehydrates up to 75 percent of fleas, mites, bedbugs and worms that may have found their way into the feed. 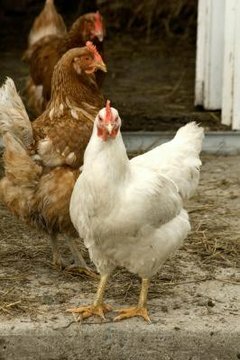 Externally, chickens will often enjoy diatomaceous earth baths, keeping their feathers and skin pest-free. As an anti-caking and anti-parasite agent, diatomaceous earth can safely be added to any bird food as directed by a veterinarian. Diatomaceous earth is a great natural treatment for parasites and worms both internally and externally. But, as an added benefit, one study showed that chickens fed a diet high in silicone dioxide, the main ingredient of diatomaceous earth, showed stronger bone formation than those that had lower doses. When it was added to chicken feed at a 2% ratio, both Bovan Brown and Lowmann Brown chickens ate more, and produced healthier, stronger eggs with more yolk. Furthermore, these chickens showed significantly improved bone mineralization when on a D.E.-enhanced diet. Some smaller birds, like finches, have more sensitive respiratory tracts and therefore D.E. baths may not be recommended by your veterinarian. The churned-up dust can result in chest congestion. In addition, because the dust is of such a fine consistency, getting it in the eyes can cause some irritation; if you are using it in a birdcage to control infestations in food, feathers and the surrounding area, allow the dust to settle before your bird is introduced. Lastly, the effectiveness of D.E. decreases significantly when it is allowed to get wet.